It is well known that the use of renewable natural resources, low cost and available in large quantities, can develop a product with a reduced impact on the environment. The objective of this work was to study the possibility of encapsulating a natural active ingredient (beet juice) in the alginate. The encapsulation of lyophilized beet juice obtained by ionotropic gelation method has been possible according to a procedure that we optimized. The beads were analysed for particle size and morphology using an optical microscopy and SEM. FTIR analysis confirmed the absence of reaction between beet juice and alginate. The characterization by XRD showed that the crystalline state of alginate changed to an amorphous state after formulation. In addition, a study on the antiradical activity of the active ingredient in encapsulated state shows that it can be preserved for a long time which indicates that the alginate can be a good support for the encapsulation, protection and use of beet juice (concentrated) in various forms as a therapeutic or dietary supplement. The red beets are a great vegetal that attracts increasing interest in many research fields like medicine, pharmacy and food technology . The plant, commonly used as juice concentrate or powder  have a wide range of health benefits due to their nutritional content, including carbohydrates, vitamins (C, A, folate), minerals (potassium, magnesium, iron, selenium, copper and phosphorus) and dietetic fibers. The health benefits of beets include the treatment of anemia, gastrointestinal and urinary disorders, cancer and heart disease. It also helps to improve blood circulation, mediate respiratory problems, aid in skin care and boosts the immune system. The vegetal is also a unique source of betalains which are emerging phytonutrients  that have been shown to provide substantial curative and protective effects on human health as they are bioactive and completely safe. The antioxidant properties of betalains from red beet are currently under active investigations [4-6]. They seem to have the highest cellular antioxidant activity [7,8] and exceptional high free radical-scavenging activity  toward the biological molecules oxidation . Despite being completely safe to consume, their chemical stability, and thus their activity and their potential application in pharmaceuticals and cosmetics or nutraceuticals would be severely compromised depending on the processing operations that the vegetal undergoes to give the desired product which effects of course the product compliance and health properties . As reported [11,12], stability of natural pigments such as betalains in the red beet are affected by, both, extrinsic and intrinsic factors. The extrinsic factors include oxygen, temperature, pH, light and chemicals while the intrinsic factors are mainly enzymes: b -glucosidases, polyphenoloxidases (PPOs) and peroxidases (PODs). To preserve the chemical or biological activities of natural origin compounds which are frequently unstable, the microencapsulation technique could be a good alternative  that enables very effective protection against process or environmental factors (oxygen, T, humidity, etc) by providing a physical barrier protecting the active substrate and increasing its stability. Among the available microencapsulation techniques, such as spray-drying, coacervation [13,14], substrate inclusion in gelled membrane is particularly interesting route using hydrophilic biopolymer like sodium alginate found to be highly potent membrane formation polymer with respect to drug delivery because of its high biological safety . Its unique property of forming water insoluble calcium alginate gel through ionotropic gelation with Ca+2 ions under very mild conditions has made it useful for the entrapment of various classes of therapeutic agents [16-18]. The objective of this study was to investigate the influence of freeze-drying/lyophilization processing operation on red beet containing alginate microcapsules prepared according to the ionotropic gelation method using calcium chloride as a crosslinking agent. The impact of processing factors was evaluated on the basis of belatains contents and stability and antioxidant activity of the processed samples. Fresh juice (pH=7.2) of local red beet was obtained from small pieces of previously washed and peeled material using Moulinex juicer and CENCOM II (Selecta®) centrifuge. Lyophilized sticky solid extract is obtained after the freeze-drying of this juice at -52°C, 0,044 mbar and during 48 h, using Chris ALPHA 1-2 LD plus instrument. Sodium alginate was purchased from Fluka as a low molecular weight polymer or extracted from Sargassum vulgare which is a local marine algae according to the method described by . The biomaterial was sterilized then stored in accordance with the procedure described by . All other reagents used herein were of analytical grade. Preparation of alginate beads containing beet juice was performed according to the following experimental protocol: to 20 ml of a 1% w/v aqueous solution of sodium alginate 2 g of lyophilized beet juice is added under continuous agitation. The pH should be kept between 5-5.3 to prevent degradation. The resulting solution is poured dropwise into 200 ml of calcium chloride, 1% w/v and the beads are allowed to cure in the CaCl2 bath during 20 min, they are then filtered and washed with distilled water. In their freeze-dryed form, the beads were immediately lyophilized using Chris ALPHA 1-2 LD plus instrument at -52°C and 0.044 mbar over 12 h.
The morphology of alginate microcapsules containing red beet extract in both, free liquid form and freeze-dried form, was evaluated using Jeol JSM-6360 LV scanning electron microscope, Japan. Prior to observation, the beads were coated with a thin layer of gold-palladium (Au/Pd). Infrared spectra of various samples were acquired from 400 to 4000 cm-1 in using Bruker ATR-FTIR Alpha–P Instrument. Bruker D2 Phaser XRD instrument was used to record the X-ray diffraction spectra. The encapsulation yield (EY) was calculated according to equation 1.
where: Cf: residual concentration obtained after encapsulation and Ci: the initial concentration determined before encapsulation. Both concentrations were determined by UV-Vis spectrophotometry at wavelength λ=535 nm corresponding to red beet juice absorption. Calibration curve was made from absorption of CaCl2–red beet juice. In order to investigate antioxidant capacity of the beets extracts in encapsulated and freeze-dried forms the DPPH assay was performed in aqueous system according to the procedure described by [21,22] with minor modification. DPPH solution was prepared by dissolving 32 mg in 1 L of 80% HPLC grade methanol. 1 ml of methanolic DPPH solution (0.1 mM) was added to 1 ml of the aqueous extract (beet juice extract) and the resulting mixture kept in the dark at room temperature for 30 min. Absorbance is measured at 517 nm using Jasco V-630 UV-Vis spectrophotometer. Reference sample containing DPPH in aqueous methanol solution was prepared similarly. The antioxidant capacity was correlated to BHT assay which was used in this work as reference compound. Percentage inhibition ARA was calculated according to equation 2 and equivalent antioxidant capacity values were determined from the standard regression curve. The EC50 value estimates of various sample extracts were obtained according to graphical method. (beet extract solution in methanol was diluted and tested for DPPH assay to find out 50% inhibition). where: Abscontrol is absorbance of control test and Abssample, the absorbance of red beet sample. The beads prepared for this study were observed under an optical microscope before and after drying. The wet beads prepared with commercial alginate (B.C) are spherical and remain spherical during drying (Figure 1A and 1B), however the beads prepared with extracted alginate (B.S) take an elongated form. The fresh beads exhibit a smooth surface, after drying the surface becomes irregular. The fresh beads have a diameter of about 3 mm and about 1 mm for dry beads (lyophilized). Figure 1: A: Photograph of a fresh bead (B.C) observed under an optical microscope. B: Photograph of a lyophilized bead (B.C) observed under an optical microscope. C: Photograph of a lyophilized bead (B.S) observed under an optical microscope. The beads were analyzed by scanning electron microscope, this characterization method will allow us to evaluate the morphology and the bead surface. The microcapsules were suffering material crushing, the beads formulated with commercial alginate appear spherical but flattened with a very irregular and rough surface, they have more the appearance of a shell more or less curled up on itself with a porous system inside which appears similar to a sponge (Figure 2A and 2B). Figure 2: A: SEM photograph of a lyophilized bead. B and C: SEM photographs at different magnifications: lyophilized beads (to the outside). The drying method has big influence on the morphological and textural properties of the obtained beads. The used pressure during the lyophilization process was the responsible for the deformation of the surface of the beads. The characterizations made by infrared spectroscopy confirmed the stability of beet juice in alginate beads. FTIR spectra of alginate show the characteristic bands of –OH stretching, -CH stretching, >C=O stretching, C-H bending and C-O-C stretching at 3288, 2940, 1594, 1406, and 1033 cm-1, respectively. In FTIR spectra of lyophilized beet juice we observed characteristic bands: vibration stretching of -OH group and NH deformation (primary amines) at 3300 and 1620 cm-1 . The spectra obtained from formulated beads, indicate the presence of both characteristic bands of beet juice and alginate at almost the same wave number. It is interesting to note that in the case of drying by lyophilization all characteristic bands of alginate and beet juice are present, confirming that the temperature and pressure didn’t touché the nature of the alginate nor the active ingredient. From these results we can deduce that there is no reaction between the two materials, beet juice and alginate, which retain their main functional groups, confirming encapsulation of beet juice and its conservation in its primary state (Figure 3). 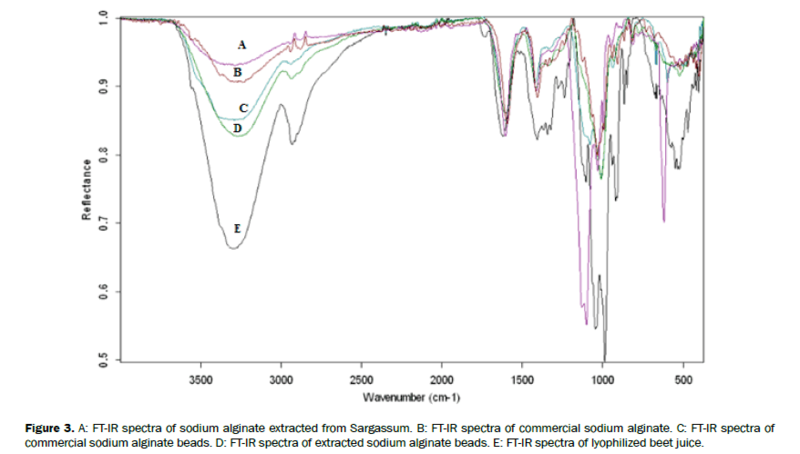 Figure 3: A: FT-IR spectra of sodium alginate extracted from Sargassum. B: FT-IR spectra of commercial sodium alginate. C: FT-IR spectra of commercial sodium alginate beads. D: FT-IR spectra of extracted sodium alginate beads. E: FT-IR spectra of lyophilized beet juice. The X-ray diffractions allowed to highlight the structural difference between the sodium alginate powder and the powder of alginate beads. 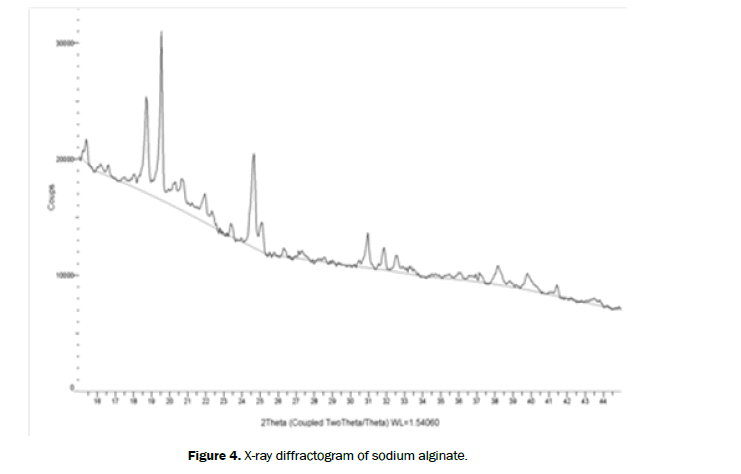 The X-ray diffraction spectrum of sodium alginate showed intense peaks at about 2θ=18.5°, 19.5°, 24.5° (Figure 4). 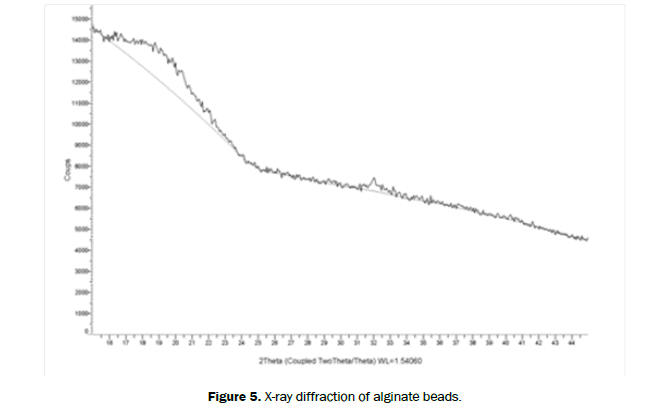 The X-ray diffraction spectrum of alginate beads showed a broad peak at about 2θ=19° (Figure 5). Figure 4: X-ray diffractogram of sodium alginate. Figure 5: X-ray diffraction of alginate beads. By comparing the results of XRD it was observed that there was a significant change in the diffraction pattern. The sodium alginate diagram shows a certain degree of crystallinity as that of the beads exhibit almost amorphous structure. The appearance of broad peak in the alginate beads may be due to the increase in the association of the alginate chains by ionic crosslinking which can distort the crystalline regions. The enlargement of the diffraction lines as well as the decrease of the measured intensities indicate a net decrease in the crystallite size. This indicates that changes in the crystalline state is produced during the preparation of the beads by ionotropic gelation method. The antiradical activity of all extracts: the alginate beads, lyophilized beet juice and BHT were determined by DPPH method. The results are shown as straight lines (Figures 6 and 7). The antiradical activity of our extracts is expressed as IC50, the extract having the lowest IC50 exerts the most powerful anti-radical activity (Table 1). 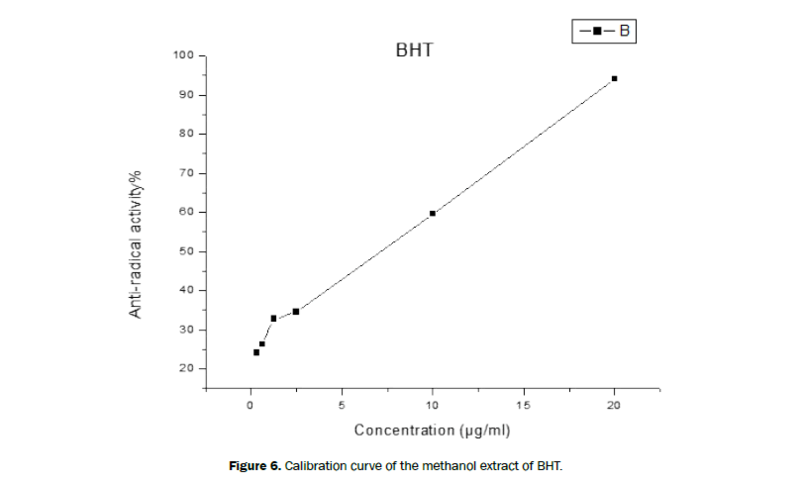 Figure 6: Calibration curve of the methanol extract of BHT. 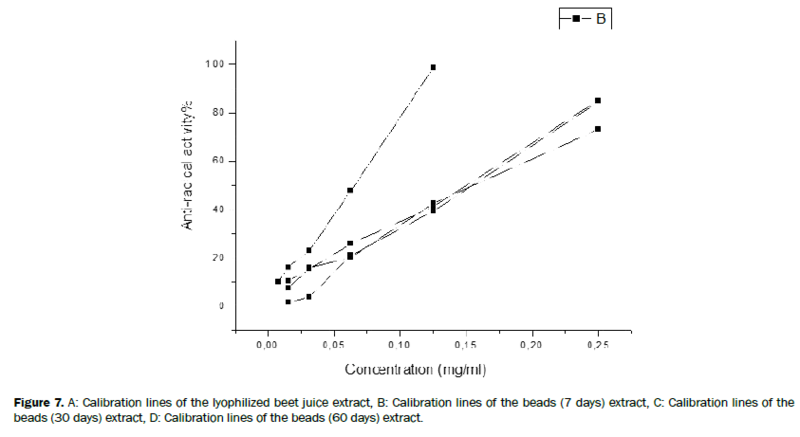 Figure 7: A: Calibration lines of the lyophilized beet juice extract, B: Calibration lines of the beads (7 days) extract, C: Calibration lines of the beads (30 days) extract, D: Calibration lines of the beads (60 days) extract. Table 1. IC50 values of the BHT methanol extract and aqueous extracts. Table 2 shows that the beads extracts kept a good activity over time with an IC50 of about 0.142 mg/ml, 0.152 mg/ml and 0.162 mg/ml for 7, 30 and 60 days respectively. Following these results it can be concluded that the alginate is a biopolymer that may provide support for the microencapsulation of beet juice. Table 2. IC50 values of the beads extracts. In this study we considered the encapsulation of beet juice in alginate. It has been possible to obtain beads in size of less than 1 mm for the lyophilized beads. The FTIR confirmed the stability of the two materials, confirming encapsulation of beet juice and its conservation in its primary state. The study of the antiradicaliare activity of the beads extracts by the method of free radical DPPH reduction showed that they maintained a good activity over time. These results showed that alginate can be a good carrier for the encapsulation of beet juice. These capsules could therefore be an alternative for certain applications in various fields: food, medical, etc. Bhagyalakshmi N. Red Beet Biotechnology: Food and Pharmaceutical Applications. Springer 2013. Dörnenburg H and Knorr D. Generation of colors and flavors in plant cell and tissue cultures. Crit Rev Plant Sci 1996;15:141-168. Florian C, et al. Betalains-emerging prospects for food scientists. Trends in Food Science & Technology 2007;18:514-525. Diego A. Betalains in the era of global agri-food science, technology and nutritional health. Phytochem Rev 2008;7:261-280. Strack D, et al. Recent advances in betalain research. Phytochemistry 2003;62:247-269. Kanner J, et al. A new class of dietary cationized antioxidants. J Agric Food Chem 2010;49:5178-5185. Song W, et al. Cellular antioxidant activity of common vegetables. Journal of Agricultural and Food Chemistry 2017;58:6621-6629. Gliszczyńska Ś, et al. Betanin, the main pigment of red beet: Molecular origin of its exceptionally high free radical-scavenging activity. Food Additives & Contaminants 2006;23:1079-1087. Pedreño MA and Escribano J. Correlation between antiradical activity and stability of betanine from Beta vulgaris L. roots under different pH, temperature and light conditions. Journal of the Science of Food and Agriculture 2001;81:627–631. Kavitha R, et al. Impact of processing of red beet on betalain content and antioxidant activity. Food Research International 2013;50:670–675. Manchali S, et al. Stability of betalain pigments of red beet (Book Chapter)/Red Beet Biotechnology: Food and Pharmaceutical Applications 2012; pp: 55-74. Mohammad IK. Stabilization of betalains: A review. Food Chemistry 2016;197:1280–1285. Kannan K and Priyanka DS. Microencapsulation of Colors by Spray Drying – A Review. International Journal of Food Engineering 2012;8:1-15. Gülay Ö and Seda EK. Microencapsulation of natural food colourants. International Journal of Nutrition and Food Sciences 2014;3:145-156. Sriamornsak P, et al. Modification of theophylline release with alginate gel formed in hard capsules. AAPS PharmSciTech 2007;08:E1-E8. Shishu S, et al. Stomach-specific drug delivery of 5-fluorouracil using floating alginate beads. AAPS PharmSciTech 2007;08:E143–E149. Mandal S, et al. Development and evaluation of calcium alginate beads prepared by sequential and simultaneous methods. Brazilian Journal of Pharmaceutical Sciences 2010;46:785-793. Karam FA. Optimization of the entrapment efficiency and release of ambroxol hydrochloride alginate beads. Journal of Applied Pharmaceutical Science 2015;5:13-19. Pérez R. La culture des algues marine dans le monde. IFREMER 1992. Vincent E. Les alginates et leurs applications en pharmacie et en ingénierie: Application a la construction d’un biomatériau, 2010; p: 135. Blois MS. Antioxidant determinations by the use of a stable free radical. Nature 1958;181:1199-1200. Brand-Williams W, et al. Use of Free Radical Method to Evaluate Antioxidant Activity, Food Science and Technology - Lebensmittel-Wissenschaft and Technologie 1958; pp: 2825-2830. Molina GA, et al. Effects of Tetraethyl Orthosilicate (TEOS) on the Light and Temperature Stability of a Pigment from Beta vulgaris and Its Potential Food Industry Applications. Molecules 2014;19:17993.